Like other food and beverage companies, McDonald's has moved aggressively into digital marketing because that is where children and teens spend so much of their time. "We own a strong relationship with kids in the real world," commented a marketing executive for the fast food chain, "and we felt we could do the same in the virtual worlds that they're living in more and more. "3 Even in the midst of an economic downturn, online marketing is holding steady.4 Many major food and beverage marketers have been increasing their interactive advertising expenditures.5 The next few years will witness further innovation and increasing sophistication in digital marketing, with important advances taking place in several key areas that will be discussed below. These developments will shape the growing digital marketplace, altering significantly the nature and scope of advertising, and enhancing the ability of marketers to insert their brands into the daily lives of young people. The interactive marketplace is still in a somewhat fluid, formative stage of development. Purveyors of junk food are at the forefront of digital marketing, promoting foods that, according to the Institute of Medicine, children should avoid. Government and self-regulatory policies developed in the next few years could change or curtail some of the emerging digital practices that companies are using to market unhealthy food products to children and adolescents, and could have long-term impacts not only on the evolution of digital marketing, but also on the health of young people. With a new presidential administration in place, we now have a critical window of opportunity for renewed public policy attention to this urgent issue. In the last several months, regulators at the Federal Trade Commission, as well as key staffers in Congress have been seeking input and guidance from advocates about the most effective policy proposals. What has been missing, however, is a solid body of research, and a concrete set of targeted policy options designed to address the most harmful interactive strategies and techniques being employed by food marketers. The food industry's rapid embrace of digital techniques raises important questions for those concerned about the impacts of food marketing on children and youth: How can recent research in the fields of communications, marketing, and child development help us understand the ways in which children, adolescents, and multicultural youth may be affected by digital marketing? What are the most problematic or harmful interactive marketing practices? What kinds of policy interventions would be particularly effective at safeguarding young people? What are the most promising areas of research that could inform public policy interventions? What are the most significant gaps in the literature where work is urgently required? What kinds of legal and policy work should NPLAN undertake in light of new marketing practices and recent research on youth development? 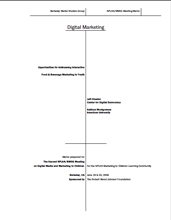 This paper is designed to serve as a background and framing document for the second NPLAN/BMSG meeting on digital marketing. In the following pages, we will: 1) summarize the key features of digital marketing that make it distinctly different from traditional advertising; 2) discuss several recent trends that are shaping the growth of interactive food marketing (and interactive marketplace in general); and 3) suggest some opportunities to protect children and adolescents from harmful food and beverage marketing in light of current political and policy openings. In today's digital marketing system, advertising, editorial content, measurement, and content delivery have been intertwined.6 Advertisers employ a host of new techniques across a variety of new-media platforms to reach and engage young people. Taken together—and viewed against the backdrop of the major changes taking place in the worlds of media, advertising, and market research—they constitute a new digital marketing paradigm. We have documented many of these practices in several longer papers.7 Below we present some of the key defining features of digital marketing. Ubiquitous connectivity: Marketers design their campaigns to take advantage of young peoples' constant connectivity to technology, their multi-tasking behaviors, and the fluidity of their media experiences. This "360 strategy" is one of the core principles of today's youth marketing, aimed at reaching viewers and users repeatedly wherever they are. Immersion: State-of-the-art animation, high-definition video and other multi-media applications are spawning a new generation of immersive environments, including interactive games and threedimensional virtual worlds. Using "dynamic product placement," ads can be incorporated into a game's storyline, and programmed to respond to a player's actions in real time, changing, adding, or updating messages to tailor their appeal to that particular individual.10 Through "rich media," the ads themselves are becoming increasingly immersive. User-generated advertising: Marketers use a variety of strategies to encourage young people to produce and promote commercials for their favorite brands. The strategy is designed to foster powerful emotional connections between consumers and products, tap into a stable of young creative talent willing to offer their services for free, and produce a new generation of "brand advocates. "11 These practices turn the conventional model of advertising on its head, transforming children from passive viewers of commercials into ad producers and distributors. Engagement: A fundamental goal of interactive advertising, "engagement" refers to the "subtle, subconscious process in which consumers begin to combine the ad's messages with their own associations, symbols and metaphors to make the brand more personally relevant. "12 The concept of engagement is being operationalized into a measurable set of responses, which will enable marketers to precisely assess and further refine their strategies for influencing individual consumer behaviors. Integrated Measurement: The advertising industry is developing an array of "new metrics" to closely analyze the nuances of interactions between users and advertising. Increasingly, measurement tools are being built directly into the ads themselves. For example, so-called "smart ads" can instantly alter an interactive advertising message based on an individual's online actions. The following is a very brief overview of some of the most significant developments in the digital marketplace that are influencing how food and beverage companies target children and youth. As social networks play an increasingly central role in the lives of young people, "social media marketing" is becoming even more sophisticated. Virtual worlds and interactive games are an expanding sector in the digital marketing landscape, attracting an increasing number of advertisers. Online video has continued to soar in popularity, becoming an increasingly popular and effective advertising medium. Mobile advertising has introduced an entire arsenal of powerful new marketing tools, especially effective for targeting youth. Neuromarketing—the use of a variety of biometric measures to help determine how advertising messages should be framed and delivered—is becoming a more powerful force in all of advertising, including food marketing. Recent advances in behavioral advertising are enabling marketers to more accurately predict and influence user behavior. Measurement of user interactions with ads is becoming increasingly precise, reflecting larger changes in how the advertising industry designs online content and generates revenues in the digital environment. These trends—which we have only briefly highlighted—will continue to shape the growing digital marketplace, transforming the very nature of advertising and marketing in the 21st century. The papers that have been written for this meeting clearly demonstrate the need for a serious reexamination of how we regulate food and beverage marketing to children and adolescents, particularly in the growing digital media landscape. As Louis Moses and Dare Baldwin point out, "digital marketing environments tend to be interactive, immersive, alluring, engaging, and motivationally and emotionally rewarding." Agnes Nairn's discussion of implicit persuasion challenges the cognitive model that has long dominated children's advertising regulation. In addition to Nairn's paper, the analysis of brain and psychosocial development during adolescence written by Constance Pechmann and her colleagues suggests youth older than 12 may require safeguards for particular kinds of marketing techniques. Given the unique health risks for obesity and related diseases faced by Latinos and African Americans, which Sonya Grier describes, we may need policies specifically designed to address multicultural marketing in digital media. NPLAN is uniquely positioned to play a leadership role in formulating a strategic legal and policy framework for addressing interactive food and beverage marketing. If informed by the latest developments in both digital marketing and academic research, such a framework could be particularly useful in the coming months, as policy makers engage in a number of proceedings that are either directly focused on, or relevant to, food marketing policy. Among the upcoming opportunities are: the newly established Interagency Working Group on Food Marketing to Children; the Federal Trade Commission's planned review of the Children's Online Privacy Protection Act (in the light of new media marketing developments, especially mobile); the current congressional interest in online marketing and privacy; and the Obama Administration's plans for health care reform (taking advantage of the President Obama's recent speech to the AMA when he discussed "junk food" and obesity). It will also be important to educate new officials at the major regulatory agencies, including the Federal Trade Commission, the Federal Communications Commission and the Department of Health and Human Services. As part of the legal analysis, we believe it is important for NPLAN to examine specific digital marketing practices that raise ethical and legal issues. Several of these techniques have been identified in the papers for this meeting. They include: integration of marketing and "content" to make the two indistinguishable; linking point of influence to point of purchase (for example, in mobile marketing campaigns); peer-to-peer strategies, especially on social network platforms; prizes, contests, and other incentives designed to encourage participation in marketing campaigns and to facilitate data collection; behavioral advertising, multicultural targeting, smart ads, and dynamic product placement; and the use of neuromarketing to develop implicit persuasion techniques. Each of these techniques should be analyzed within the context of recent research on child and adolescent development, current government advertising regulations (at both the FTC and the FCC), industry self-regulatory guidelines, and First Amendment jurisprudence. Age categories should be carefully revisited when considering the appropriateness of certain practices, especially given what we know about adolescent vulnerabilities. It may well be that some of these emerging practices could already be considered deceptive and unfair under current laws. While the FTC is constrained from launching broad rulemaking procedures, it can and does act on individual complaints. This was the strategy that advocates used successfully on children's privacy during the 90s (along with a strategic media campaign), which led directly to passage of the Children's Online Privacy Protection Act.41 NPLAN could provide valuable legal analysis for identifying the practices that may violate existing laws. NPLAN could also develop model language for regulatory proposals that could address the use of certain techniques for marketing food and beverage products to children and adolescents. Finally, we would urge NPLAN to work closely with a network of experts in the fields of child development and marketing to develop a long-range legal and policy research agenda. While we recognize that resources are limited, we also believe that strategic efforts in the next few years could have a lasting impact on the public health. 1. "McDonald's New Virtual World: More Platform than Website," Virtual Worlds News, 19 Sept. 2008, http://www.virtualworldsnews.com/2008/09/mcdonalds.html; "McDonald's Launching Virtual World," Virtual Worlds News, 4 Aug. 2008, http://www.virtualworldsnews.com/2008/08/mcdonalds-launch.html (both last viewed 7 June 2009). 2. Rita Chang, "AKQA Embodies New Digital-Agency Model," Advertising Age , 30 Mar. 2009, http://adage.com/article/special-report-digital-alist-2009/digital-a-list-2009-akqa-embodies-digital-agency-model/135583/ (last viewed 7 June 2009). 3. Brian Quinton, "Happy World," Promo , 1 Oct. 2008, http://promomagazine.com/interactivemarketing/1001-starwars-promotion/ (last viewed 7 June 2009). 4. Internet Advertising Revenues at $5.5 Billion in Q1 '09, IAB, 5 June 2009, http://www.iab.net/about_the_iab/recent_press_releases/press_release_archive/press_release/pr-060509 (last viewed 7 June 2009). 5. Although online spending is still a relatively modest percentage of food industry overall U.S. ad expenditures, it is increasingly regarded as one of the most cost-effective ways to reach and engage young people. Unlike a more traditional ad buy on television, a more modest amount of money can buy millions of online ad "impressions." For example, Nielsen reported that just for the period of March 2-March 8, 2009, Kraft Foods, General Mills, and Unilever delivered 77 million, 62 million, and 54 million online ad impressions, respectively . ConAgra, Mars, Pepsi, Burger King and Yum Brands all increased their Internet display spending in 2007 from the previous year. But due to the nature of Internet marketing, actual expenditures do not necessarily reflect the impact of an ad or a campaign, especially when it involves social media marketing, user-generated ads, and other forms of peer-to-peer creation and transmission, which are very inexpensive to implement. "100 Leading National Advertisers, "Advertising Age , 23 June 2008, http://adage.com/datacenter/article?article_id=127791 (last viewed 7 June 2009). 6. Chester and Montgomery, "Interactive Food & Beverage Marketing: Targeting Children and Youth in the Digital Age." 7. Chester and Montgomery, "Interactive Food & Beverage Marketing: Targeting Children and Youth in the Digital Age. An Update." Jeff Chester and Kathryn C. Montgomery, "Interactive Food & Beverage Marketing: Targeting Adolescents in the Digital Age," Journal of Adolescent Health , in press. 8. D. Hallerman, " Behavioral Targeting: Marketing Trends," eMarketer , 2008. I. Khan, B. Weishaar, L. Polinsky, et al, "Nothing but Net: 2008 Internet Investment Guide," 2008, https://mm.jpmorgan.com/stp/t/c.do?i=2082C-248&u=a_p*d_170762.pdf (last viewed 23 Mar. 2009). 9. Xtract, Social Intelligence, http://www.xtract.com/social-intelligence-3rd-column-info (last viewed 26 Mar. 2009). 10. J. Gaudiosi, "Google Gets In-game with Adscape," The Hollywood Reporter , 20 Mar. 2007, http://www.hollywoodreporter.com/news/google-gets-game-adscape-132422; M. Shields, "In-game Ads Could Reach $2 Bil," Adweek , 12 Apr. 2006, http://www.adweek.com/aw/national/article_display.jsp?vnu_content_id=1002343563 (both last viewed 2 Oct. 2008). 11. DoubleClick, "DoubleClick Rich Media and Video," http://www.doubleclick.com/products/richmedia/index.aspx; Meez, "Advertise with Us," http://www.meez.com/help.dm?sect=8; Studiocom, "Immersive Online Experiences," http://www.studiocom.com/godeep/ (all last viewed 2 Oct. 2008). 12. J. Nail, "The 4 Types of Engagement," iMedia Connection , 13 Oct. 2006, http://www.imediaconnection.com/content/11633.asp (viewed 2 Oct. 2008). The engagement paradigm for marketing is a current focus of a new Advertising Research Foundation council, which has been examining recent developments in neuroscience for marketing purposes. ARF Engagement Council, http://www.thearf.org/assets/engagement-council (last viewed 7 June 2009). 13. According to comScore, " ...social networking category experienced a record month, growing 12 percent to nearly 140 million visitors, or nearly three-quarters of the U.S. online population. MySpace Sites led the category with 71 million visitors, followed by Facebook.com with 67.5 million visitors, an increase of 10 percent from the previous month. Twitter.com, now the third ranked social networking site, experienced another explosive month of visitor growth, jumping 83 percent to 17 million visitors." Comscore, "Comscore Media Metrix Ranks Top 50 U.S. Web Properties For April 2009," http://www.comscore.com/Insights/Press_Releases/2009/5/Social_Networking_Category_Has_Record_Month_Led_by_Gains_at_Twitter_and_Facebook; "Teens on Social Networks," eMarketer, 16 Apr. 2009, http://www.emarketer.com/Article.aspx?R=1007041 (both last viewed 5 May. 2009). 14. "US Social Network Ad Spending Growth Lowered," eMarketer , 10 Dec. 2008, http://www.emarketer.com/Article.aspx?R=1006799 (last viewed 7 June 2009). 15. Chester and Montgomery, "Interactive Food & Beverage Marketing: Targeting Children and Youth in the Digital Age. An Update." For example, Coca-Cola recently launched a "digital communications and social media" division to bolster its new media marketing capabilities. Nicole Zerillo, "Coca-Cola Launches Office of Digital and Social Media," PRWeek , 3 Apr. 2009, http://www.prweekus.com/coca-cola-launches-office-of-digital-and-social-media/article/130087/ (subscription required). For Pepsi's similar efforts, see Elaine Wong, "Pepsi Sees a Chance to Fill Newspapers' Void," Brandweek , 9 May 2009 http://www.brandweek.com/bw/content_display/news-andfeatures/digital/e3i3afff90a1a8b3753a3bbca508d3329ab?pn=1 (last viewed 7 June 2009). 16. BuzzLogic, "Get Your Ads in Front of Passionate Consumers," http://www.buzzlogic.com/advertisers/conversation-targeting.html (last viewed 7 June 2009). 17. Widgets have spawned their own set of marketing metrics for measuring their impact, including viral distribution, geographic distribution, average interaction, widgets served per day, ratio of views to conversion, and referral sales from widgets. Raquel Krouse, "Widgets are the New Ad Unit," Scribd, http://www.scribd.com/doc/4959574/Widgets-Are-the-New-Ad-Units (last viewed 7 June 2009). 18. Leigh Alexander, "Analyst: In-Game Ad "Spending to Reach $1 Billion By 2014," Gamasutra, 26 May 2009, http://www.gamasutra.com/php-bin/news_index.php?story=23751 (last viewed 7 June 2009). 19. By 2012, according to eMarketer , 50 percent of all 3-11 year olds online (8.7 million children) and a quarter of all online teens will be using some form of virtual world. Mike Shields, "Kids' Virtual Worlds Gain Traction," Adweek , 22 May 2009, http://www.adweek.com/aw/content_display/news/digital/e3i9659c5aa3ebf280624968fca48925660 (viewed 7 June 2009). In 2007, more than $2 billion had been invested in these interactive environments. "$594 million Invested in 63 Virtual Worlds-Related Companies in 2008," Virtual Worlds News , 20 Jan. 2009, http://venturebeat.com/2009/01/21/virtual-worlds-raised-594-million-in-2008/ (last viewed 7 June 2009). A January 2009 report documented more than 200 youth-oriented virtual worlds that are already live or in development. "Virtual Worlds Management Report: 200+ Youth-Oriented Worlds Live or Developing," http://consiliera.wordpress.com/2009/01/29/virtual-worlds-management-report-200-youth-oriented-worlds-live-or-developing/ (last viewed 7 June 2009). 20. Microsoft Advertising, "Doritos and Xbox Put Fans in Control," http://advertising.microsoft.com/en-us/video/62ab1bf4-cdcc-4b89-8a57-ff558c93ebf3/doritos-and-xbox-put-fans-in-control-microsoft-advertising (last viewed 7 June 2009). 21. "How People Share Online Video." 22. "Marketers Eye Online Video for 2009," eMarketer , 9 Jan. 2009, http://www.emarketer.com/Articles/Print.aspx?1006848 (last viewed 7 June 2009). 23. See, for example, CableLabs, "Advanced Advertising," http://www.cablelabs.com/projects/dpi/ Burger King is reportedly interested in using the new system. Burt Helm, "Will Targeted TV Ads Justify Higher Fees?" BusinessWeek , 7 Apr. 2009, http://www.businessweek.com/magazine/content/09_16/b4127000389178.htm?campaign_id=rss_daily (both last viewed 7 June 2009). 24. Brooks Barnes, "Serving 3 Brands: Burger King, Google and Seth MacFarlane," New York Times , 17 Aug. 2008, http://www.nytimes.com/2008/08/18/business/media/18burger.html; Brian Morrissey, "Carl's Jr. Makes New Kind of Network Buy," Adweek , 1 June 2009, http://www.adweek.com/news/technology/carls-jr-makes-new-kind-network-buy-99446 (both last viewed 7 June 2009). 25. "Demonstrating the Branding and Engagement Value of YouTube Advertising," YouTube, 2009, personal copy. 26. Enid Burns, "U.S. Mobile Ad Revenue to Grow Significantly through 2013," ClickZ, 25 Feb. 2009, http://www.clickz.com/3632919 (last viewed 7 June 2009). 27. "46% OF U.S. Tweens Use a Cell Phone, Nielsen Reports," press release, 10 Sept 2008, http://www.nielsenmobile.com/html/press%20releases/MobileKids.html; CTIAThe Wireless Association and Harris Interactive, "Teenagers: A Generation Unplugged," 2008, http://www.ctia.org/advocacy/research/index.cfm/AID/1148; Briabe Media, "Mobile Marketing to Multicultural Audiences," http://briabemedia.com/documents/articles/Mobile_Marketing_to_Multicultural_Audiences.php (all last viewed 7 June 2009). 28. Center for Digital Democracy and U.S. PIRG, "Complaint and Request for Inquiry and Injunctive Relief Concerning Unfair and Deceptive Mobile Marketing Practices," Federal Trade Commission Filing, 13 Jan. 2009, http://www.democraticmedia.org/current_projects/privacy/analysis/mobile_marketing (last viewed 7 June 2009). 29. Center for Digital Democracy, "Digital Marketing Update: News on Digital Food Marketing Since Our Report was Released," http://www.digitalads.org/updates.php (last viewed 7 June 2009). 30. A recent study noted there were 90 private neuromarketing research firms in the U.S. R. M. Wilson, J. Gaines, and R. P. Hill, "Neuromarketing and Consumer Free Will," Journal of Consumer Affairs 42(3):389-410. 31. See, for example, "NeuroFocus Launches NGame; New Suite of Neuromarketing Products and Services for the Videogame Industry Elite. Neurofocus," press release, 26 Mar. 2009, http://www.reuters.com/article/pressRelease/idUS194952+26-Mar-2009+PRN20090326; Steve McClellan, "Coca-Cola Use: Mind Over Matter: New Tools Put Brands in Touch with Feelings," Adweek , 18 Feb. 2008, http://www.adweek.com/aw/content_display/news/media/e3i975331243e08d74c5b66f857ff12cfd5?pn=1 (both last viewed 7 June 2009). 32. "The Orange Underground," Cheetos Case Study, Ogilvy Awards, http://www.thearf.org/ogilvy-09 (last viewed 7 June 2009). 33. "The Orange Underground," Cheetos Case Study, Ogilvy Awards. 34. "About Acxiom," http://acxiom.com/ (last viewed 7 June 2009). 35. "ValueClick Media Launches Predictive Behavioral Targeting," press release, 21 July 2008, http://www.adoperationsonline.com/2008/07/21/valueclick-media-launches-predictive-behavioral-targeting/; Acxiom, "Digital Marketing Services," http://www.acxiom.com; "24/7 Real Media Launches Social Media Targeting to Improve Ad Performance and Response," press release, 27 Apr. 2009, http://www.247realmedia.com/EN-US/news/article_445.html (all last viewed 7 June 2009). 36. "DataPortibility Project," DataPortability.org, http://www.dataportability.org/; "What is OpenID?" http://openid.net/what/; Dave Morin, "Announcing Facebook Connect," 9 May 2008, https://developers.facebook.com/blog/post/2008/05/09/announcing-facebook-connect/ (all last viewed 7 June 2009). 37. For example, a video "captivation score" "reveals any 'hotpsots' in the video where viewers ... re-watch specific segments ... [and] cause intense audience interaction." Visible Measures, "Video Metrics," http://www.visiblemeasures.com/video-metrics/ (last viewed 7 June 2009). 38. "RockYou Adds Video to its Ad Network," RockYou Super Blog, 3 Feb. 2009, http://blog.rockyouads.com/?cat=20 (last viewed 7 June 2009). 39. Mark Walsh, "VideoEgg Ties Ad Placement To Attention Metrics," Online Media Daily, 7 May 2009, http://www.mediapost.com/publications/article/105527/videoegg-ties-ad-placement-to-attention-metrics.html; VideoEgg, "Introducing AttentionRank," http://www.videoegg.com/attentionrank (both last viewed 7 June 2009). 40. Coca-Cola told advertising agencies this spring that "We want our agencies to earn their profitability, but it's not guaranteed," said Sarah Armstrong, Coke's director of worldwide media and communication operations .... "We need them to be profitable and healthy, but they have to earn it through performance." Quoted in Vigyan Arya, "Coke Plans to go for Value-Based Compensation," Business24/7, 6 May 2009, http://adage.com/article?article_id=136266 (last viewed 7 June 2009). 41. For a detailed case study of the campaign to pass COPPA, see Chapter 4, "Web of Deception," in Kathryn C. Montgomery, Generation Digital: Politics, Commerce, and Childhood in the Age of the Internet (Cambridge, MA: MIT Press, 2007).